But will the hype outweigh the truth? A fine example of guitar building at its best. Not a single thing to fault about the instrument. Dale Fairbanks is a rising star in the world of guitar building. Living and working in his own one-man shop in Connecticut, USA, his work is inspired by the great vintage designs of the 1920s, 30s and 40s. early designs from the golden age of the American guitar and make them as good - if not better - than the old designs. 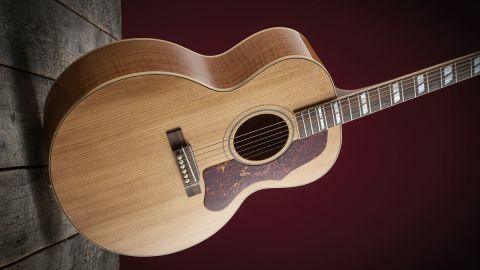 Modelled upon a Gibson J-185, the F-40 features a torrefied red spruce top, paired with torrefied maple back and sides which produces a clarity that is hard to find on models of this size. The dovetail-joined neck combines Honduran mahogany with a ziricote fingerboard accented by MOP parallelogram fingerboard inlay. All the materials used for this guitar are top-of-the-range and the timber is enhanced by a nitrocellulose-over-shellac finish. Before we’ve strummed a single note we’re in awe. It certainly is a stunner! However, the first thing that struck us upon opening the case is the guitar’s divine aroma. Like a Florentine furniture store; the scent of timber and wood glue screams style and quality. While smell has no bearing on sound or playability of the instrument, it is definitely part of the enjoyment with tonewoods such as this. This intimate encounter with the F-40’s internal body parts reveals an extremely high build standard indeed. While the vintage Gibsons were never obsessively immaculate, the F-40 truly is a work of art on the inside, as well as on the outside. The back braces are some of the most delicate we have ever seen. All four are barely a quarter of an inch wide, and they have been carved tall and thin; tapering gracefully as they tuck under the kerfing, making the back of the guitar extremely resonant. In fact, so resonant is it that when you tap the back of the guitar it is akin to tapping a drum skin. The top braces are also carved with great finesse and the intersection of the X-braces is some of the neatest we have ever encountered. This time and attention to detail is well worth it when it comes to the tone of the guitar too, as we’ll discover. The F-40 does indeed look every bit like the vintage classic. That said, there are a few modernities. Fairbanks has incorporated a two-way truss rod into the neck, which is described as having a ‘modern c’ profile. The neck has noticeably less depth than those from the 20s or 30s, though, yet retains a full roundness that feels more like something from the 50s. Overall, it’s difficult to find a single thing to fault about the build of the guitar. Every detail is crafted to absolute perfection. While this is no surprise for a guitar of this price, it’s remarkable all the same. The F-40 is truly a powerhouse guitar that begs to be throttled with a pick, yet has gorgeous, woody tone when played with fingers. A consummate all-rounder, it responds obediently to any playing style that is thrown at it. Its presence ensures the clarity and articulation you need for fingerpicking, while its gutsy output and decent headroom mean it can indeed blow your head off (should you so wish). That said, while deep and resounding bass can often be overpowering and difficult to tame, here it remains beautifully controlled. Rich, hearty, wood-toned mid- range provides the kind of mellow power that fills a room and drives everything along without ever sounding too raucous. This is a quality that all really great acoustics possess. Overall, the sound is majestic and the tones are extremely balanced; each end of the tonal spectrum seems to have its own proportionate, correct weight. The F-40 is a very easy guitar to play in standard as well as open tunings. The bass end remains commendably defined and the plain strings are never overpowered. Due to the torrefication process, the F-40 definitely has the sound of a vintage instrument. However, no scientific process can fully replicate 80 years of life experience and wear, so, as you’d expect, this instrument is still a little fresh sounding at the time of the review. To be clear, however, that is ‘fresh sounding’ as compared to the North American Guitar Company’s bold statement that Fairbanks guitars sound 100 years old. As the years progress, we would love to hear how this already-magical tone develops. OK, so at this price, the Fairbanks F-40 will not be for everybody. And while we do aim to review ‘affordable’ guitars - typically priced between £200-£2,000 - it is impossible to ignore such a fine example of guitar building. It really is a joy to see, hear, play and write about a guitar of this stature. The build quality, as well as the precision and depth of the F-40’s tone, are second to none. By no means a mere vintage clone, it sounds spectacular right now. One can only imagine what this beauty is going to sound like after 30 years of solid playing on it. For anyone prepared to pay £5,750 for a guitar, you would, of course, expect a faultless instrument. And the craftsmanship that has gone into this instrument is truly breathtaking. If Mr Fairbanks offered to give this F-40 away free of charge to any person that could find a gripe with the build, i would be confident he’d be holding onto it. You could look at this guitar for hours and not find a single thing to fault. Every angle, part and detail is executed with the kind of meticulous precision rarely seen in guitar-making at any level. Absolutely impeccable. If you’re packing for something in this price range, I’d definitely check Mr Fairbanks out.